Summary: The Scripting Wife interrupts Brahms to learn how to use Windows PowerShell to find service accounts and service start modes. Microsoft Scripting Guy, Ed Wilson, is here. One of life’s real pleasures is sitting around a fireplace, listening to a Brahms concerto, and sipping a cup of chamomile tea. I like to add a bit of local honey, and drop in a cinnamon stick. So here I am…mellow and as relaxed as a cat lying in a bay window on a warm summer afternoon. The Charlotte SQL User Group meeting tonight will be awesome. We have not seen Chris Skorlinski (the speaker) since the Raleigh SQL Saturday, so we are excited to go. The Scripting Wife and I will have a great time, and it is nice chance to see some friends we have not seen for a while. Anyway, now it is time for a warm fire, a little Brahms, and a cup of warm (but not boiling) tea. About to nod off, I was suddenly startled back into reality as the overhead light suddenly switched on. “How can you see in here in the dark,” the Scripting Wife exclaimed. “There was nothing to see—I was listening to Brahms,” I began. “Show me your command,” I wearily asked. She plopped down beside me on the sofa and showed me her laptop. She had typed the single command shown here. “You know that there is more information don’t you?” I asked. 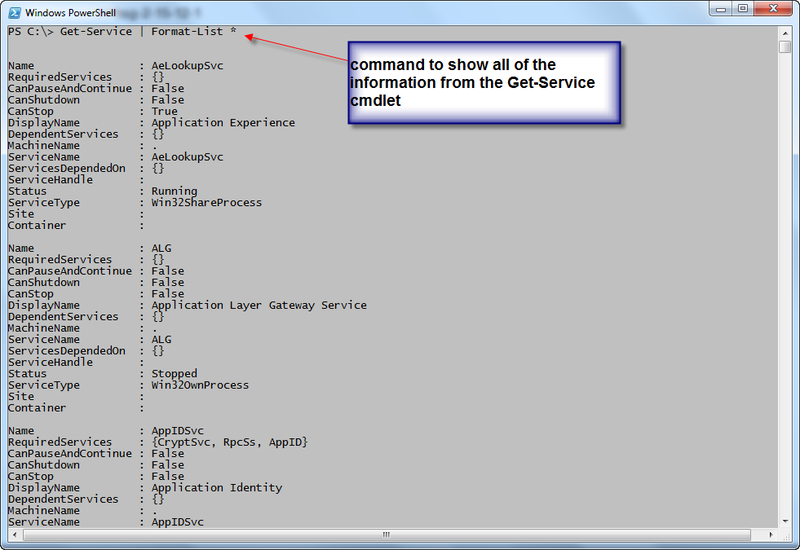 Here is what the Scripting Wife did to clear the screen and to obtain all the information available from the Get-Service cmdlet. She cleared the screen by using the Clear-Host command. But instead of typing Clear-Host, she used the cls shortcut command instead. Next, she pressed the Up arrow one time to retrieve the previous Get-Service command. She then typed a space <space> by tapping the Space bar one time, and then she typed a pipe character (the pipe character | is located above the Enter key on my keyboard). She then typed a space and Format-List * after the pipe character. 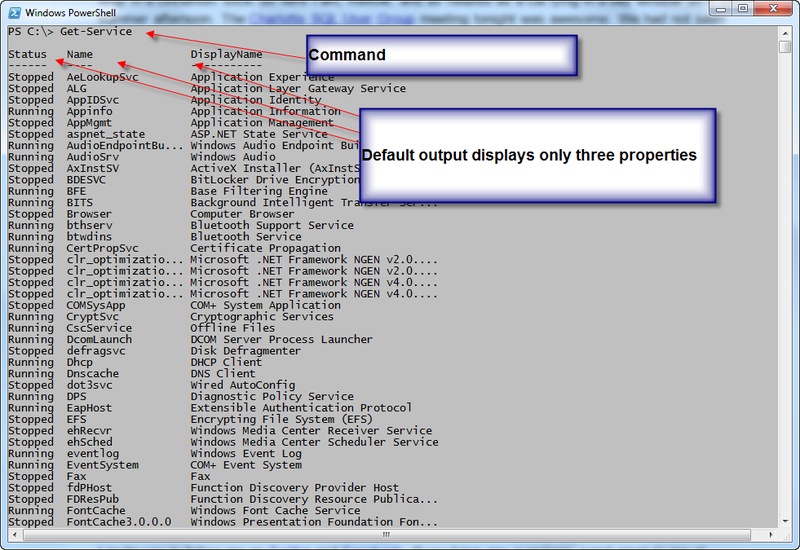 The complete command is shown here. “OK. I am looking at this output, and I still do not see anything about the service account that a service uses to start up,” she complained. The Scripting Wife thought for a few seconds, and then she typed the following command. “Wow, that is a lot of information,” she exclaimed. She turned the laptop monitor so I could look at the display. Indeed, as is shown here, it is a lot of information. “Use the same technique that you used yesterday to find the WMI class you need to work with services,” I prompted. 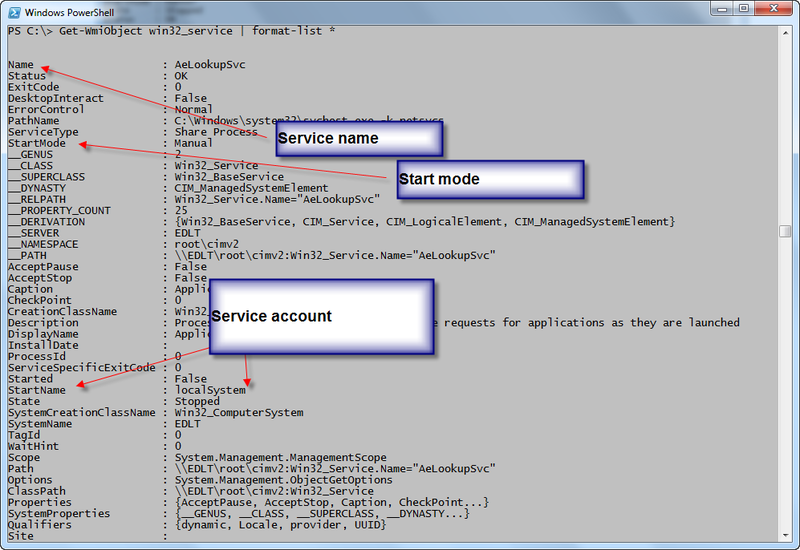 Within a few minutes, the Scripting Wife was pointing at Win32_Service. “Now use the Get-WmiObject cmdlet to query that WMI class,” I said. 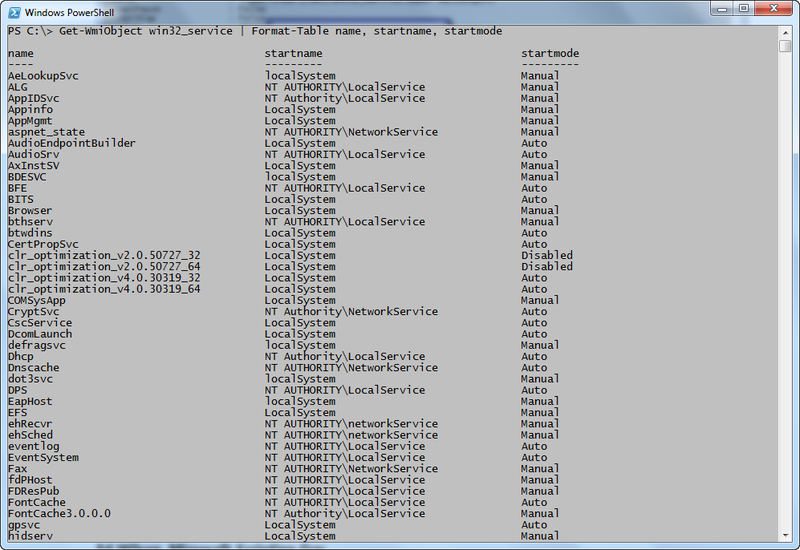 It did not take her long to modify her command line to query the Win32_Service WMI class. Here is the command she composed. 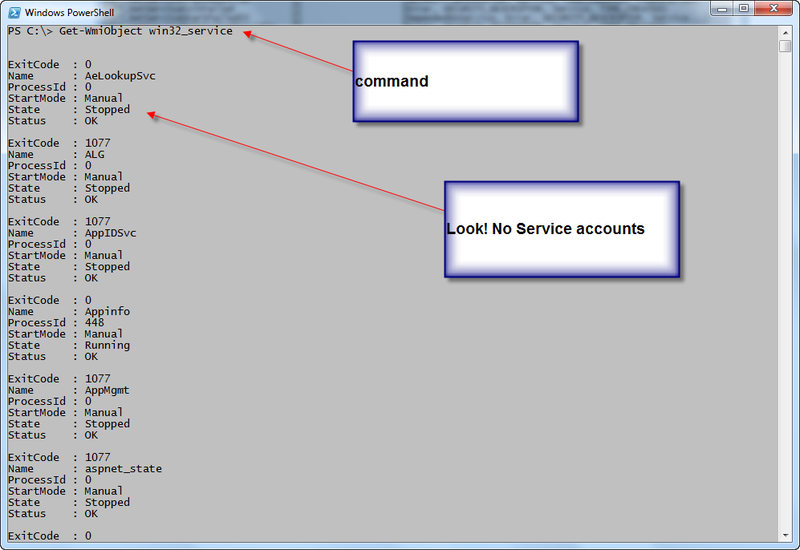 The command and the associated results are shown in the image that follows. “OK, so where are the service accounts?” she asked. “Remember, you need to use the same technique that you used with the Get-Service cmdlet to retrieve all the information,” I said. She thought for a bit, then pressed the Up arrow to retrieve the previous command. Then she added a pipeline character and the Format-List cmdlet. The revised command is shown here. “So where is the service account name?” she asked. This time the Scripting Wife did not hesitate. She first cleared the screen, then used the Up arrow to retrieve the previous command. She then edited it by changing it to a Format-Table command. 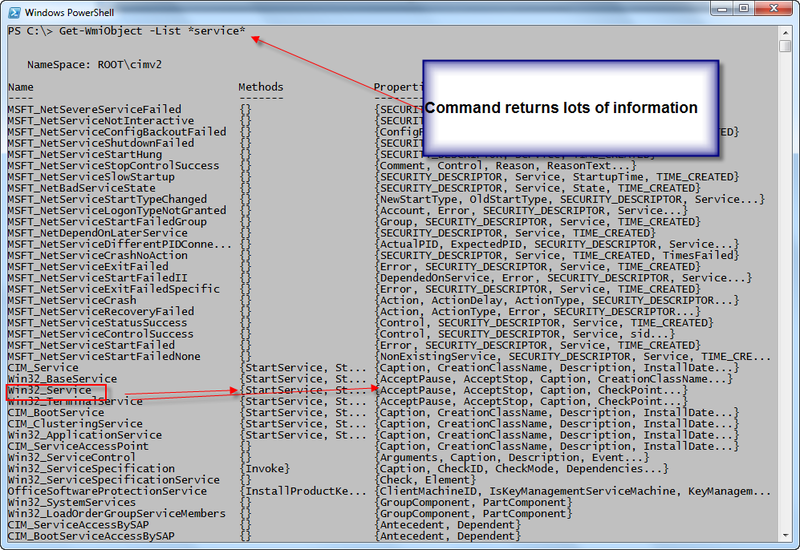 The command that she arrived at is shown here with its associated output. And with that, she was gone. Just in time for the Andante movement in D-major. Brahms may not have had Windows PowerShell in mind when he wrote, but somehow it seems to fit.